Mike Larson sat in his usual seats in the River Spirit Expo Center on Tuesday night, watching the prelim races from the Turns 3/4 grandstand just like he always does during Chili Bowl week. Except something about Tuesday was very different than normal. 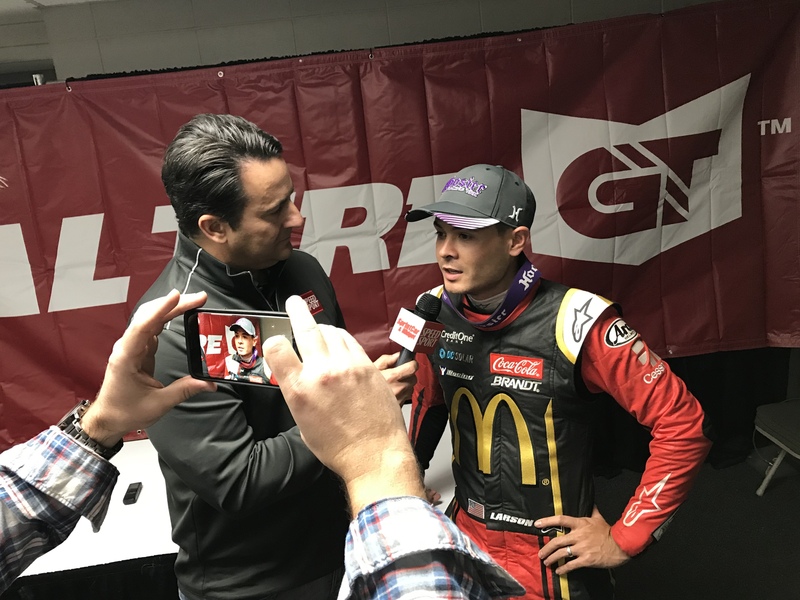 That’s because Mike was the car owner for a vehicle driven by his son, all-around racing star Kyle Larson, for the first time since 2008. Kyle was 15 back then. After that, Kyle was in bigger cars that required a professional owner and a sponsored ride. So Mike was content to enjoy the races just like he always had — as a spectator. But a couple years ago, Mike became the owner of a midget prepared by Keith Kunz Motorsports (the team Kyle usually runs for). The arrangement is similar to a Joe Gibbs Racing/Furniture Row Racing relationship in NASCAR, Kyle explained. Mike hadn’t had much success so far, though. His car made the D-Main the first year it entered the Chili Bowl and then only got to the F-Main last year. Kyle could tell his dad was disappointed. So this summer, Kyle came up with an idea: Since he was already locked in for the 2018 A-Main (based on his win in the 2017 Race of Champions), what if father and son teamed up to race together? “I was like, ‘Why? Why would you want do that? '” Mike recalled. “He goes, ‘Because I’m locked in, Dad. And I can get your car in the main event. There was a significant problem, though. Mike had promised Kunz and co-owner Pete Willoughby he wouldn’t take Kyle away from their stable — and he had no intention of breaking his word. So Mike told his son if he really wanted to do it, Kyle had to call them and broach the topic himself. But Kunz approved it — likely on a one-time basis — and so there was Kyle on Tuesday, racing around the expo center for his dad once again. The reunion ended with the best possible result, at least for a prelim night: Kyle held off future brother-in-law Brad Sweet for the win as Mike watched from his usual seats before running down to victory lane. Once there, father and son greeted each other with wide grins and handshakes. Kyle got a plaque for being the winning driver; Mike got one as the winning owner. Now they’ll go after a Golden Driller trophy on Saturday night. Together.